Download the latest apps for your desktop and mobile devices. Check out our help centre for help & support. Read the most frequently asked questions from our users. Read about how we're so developer friendly. Read a bit about the people & company behind Natterly. Earn money by referring us to your friends & customers. If you have any questions, we'll be more than happy to answer them for you. Just drop us an email, start a chat or call us on 0330 229 0100. If you have clients that you'd like to provide Natterly to, we offer a Reseller account that allows you to set up your own client accounts, and bill them externally. If you're interested in becoming a Reseller, just get in touch with us. Once you've been set up a reseller, you can start creating accounts. When you login to the Admin Console, you'll find a link on the left hand side within Settings - Resold Accounts. Enter a name and subdomain for the account, then the email address, password and name for the initial administrator of the account. 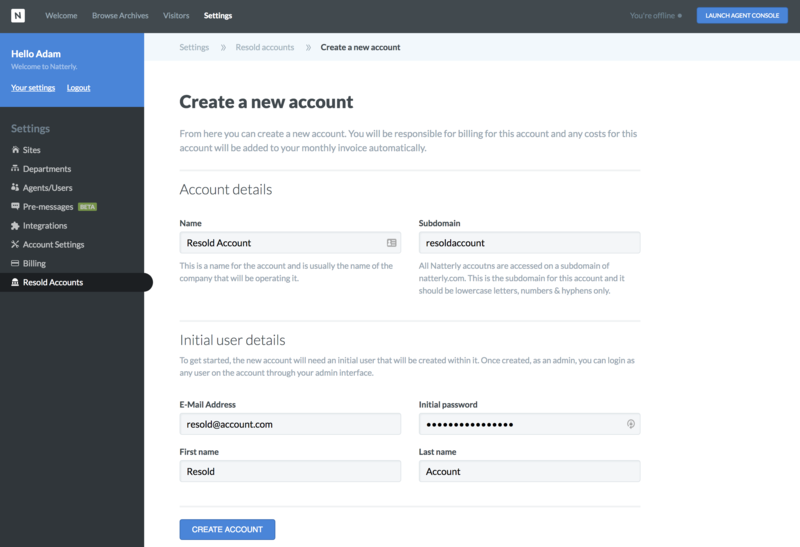 Once you've created the account, you can connect as any user, and your client can login and administer their account themselves if they wish. Natterly is an aTech Media innovation.